Alchimia Grow Shop offers gifts for each purchase you make at our website, when buying seeds, paraphernalia or growing material. 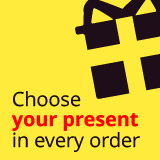 To find out about the gift you are entitled to, you only have to check the total price of your purchase, not including the cost of delivery or the fee for cash on delivery. Save money with Alchimiaweb and grow happy. Get a discount on your next purchase in Alchimia Grow Shop with this promotional voucher and save money thanks to your confidence on us. The discount depends on the total amount of your purchase, being 10% of it. If you spend 50€, you get a 5€ discount (10%). If you spend 100€, then it is a 10€ discount...no limits! This discount is not accumulable with other promotions and will be automatically applied on your next purchase. It is valid for 6 months.